A warning label is attached to a package of Tide laundry detergent packet. Procter & Gamble says it’s working to stop the “Tide Pod challenge,”  a social media-fueled trend in which teenagers eat single-load laundry detergent packets. Believe it or not, Sen. Charles Schumer was more than five years early to the Tide Pod Challenge party. In a 2012 news conference, he warned of the risks of the colorful product, claiming: "These pods were supposed to make household chores easier, not tempt our children to swallow harmful chemicals. I saw one on my staffer's desk, and I wanted to eat it." Clearly the senator was not tempted to eat laundry detergent, but it seems any number of children were. In a news release two years later, Schumer's office referenced a study published in the medical journal Pediatrics in which researchers reported that more than 17,000 children under age 6 had ingested the contents of detergent pods, leading to 750 hospitalizations. 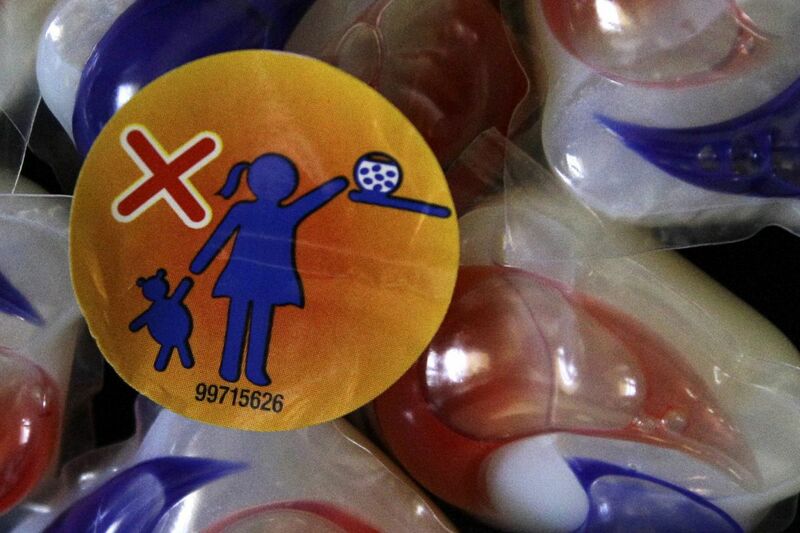 Schumer, predictably, called for stricter regulation of detergent pods in the name of "the children." But unless we're willing to immobilize our children for 18 years, we have to weigh trade-offs in safety against all kinds of other things. Around 450,000 children under age 6 are hospitalized annually in the United States. Detergent pods account for around two-tenths of 1 percent of that number. Schumer's unstated assumption was that parents are incapable of keeping detergent pods away from their children, so the government should do it for them. Maybe he should have paid more attention to childhood respiratory diseases, which account for 300 times the number of hospitalizations. But then again, Schumer did not find a bowl of pneumonia on his staffer's desk. What Schumer could not have known back in 2012 was that detergent pods would extend into the adult world in the form of the Tide Pod Challenge, which went viral on YouTube following a satirical story on the Onion last year. High school and college students took that bait, and began biting into plastic-encased detergent in alarming numbers. The nonsense came to a head recently when a Utah State University student had to be hospitalized after swallowing an entire pod. The university put Eric Warren, director of media relations, in the uncomfortable position of having to explain to a waiting media what had happened and why. Not surprisingly, he offered no insight as to why a young woman would eat a packet of laundry detergent, but was quick to say, "For students and members of our university who are feeling overwhelmed, we have services available." Certainly, students who feel overwhelmed should seek counseling services. But generally, people don't eat detergent pods because they are overwhelmed. They eat detergent pods because they are stupid. Warren gave no indication what kind of counseling services the university could give to people this profoundly dumb or, indeed, troubled. He was in a no-win situation without question. Schumer's earlier reaction to detergent pods was more understandable in context, though. After all, he was doing it "for the children," which, for a politician, is right up there with God, mom and apple pie. Schumer's urge to regulate is also par for the course for a politician who has made a career of telling other people how to live their lives. But we have gotten to the point where par for the course is a college offering counseling services for students who somehow got through 18 birthdays without learning that eating poison on a dare is just idiotic. The short lesson is that maybe it is time for people to take some responsibility for their own lives. After all, that's exactly what Schumer did. For all his bluster about regulating detergent pods, when he saw that pod on his staffer's desk, he did an astonishing thing: He didn't eat it. Schumer didn't need regulations to tell him not to eat detergent, he only needed common sense. College students should be expected to have at least as much common sense as a sitting senator. Antony Davies is an associate professor of economics at Duquesne University in Pittsburgh. James R. Harrigan is CEO of FreedomTrust. They host the weekly podcast "Words & Numbers." They wrote this for InsideSources.com.